The Drum Corps International Hall of Fame is where the legends of drum corps are remembered for the indelible impressions they have left on the activity. Started in 1985, today nearly 90 people enjoy membership in the Hall of Fame. An election by DCI corps directors and current Hall of Fame members in the spring determines who will join the Hall's elite ranks each year. Before that election takes place, however, anyone can nominate an individual for consideration. A Monday, Feb. 16 deadline is fast approaching for all Class of 2009 nomination letters. 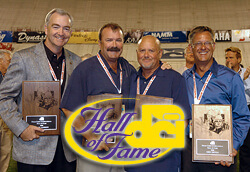 Learn more about the Hall of Fame nomination process. View all members of the Hall of Fame members.